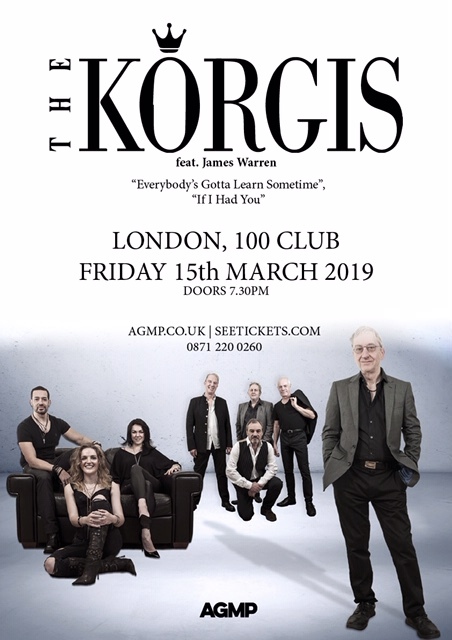 The Korgis, featuring James Warren, perform at the iconic 100 Club. 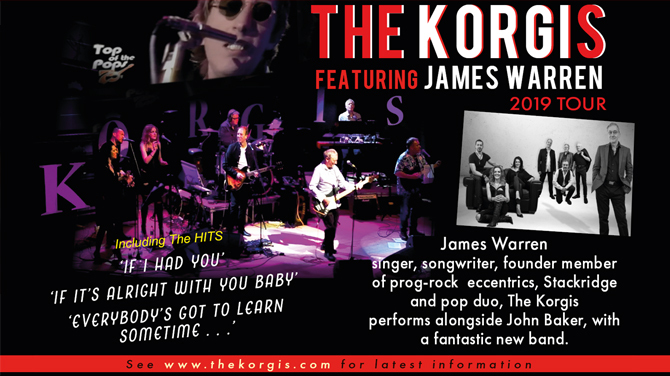 Enjoy the new slick 5-piece band and trio of backing vocalists performing all the favourites plus great new material. This is the first time this album has ever been available on CD. The James Montgomery Blues Band was popular in the early seventies and they were often associated with other more popular groups like J. Geils Band and Aerosmith. Montgomery’s band was originally signed to the Capricorn label and then Island. But by the time Duck Fever was recorded, he had switched to the independent Warehouse label. Most likely because the band never scored that elusive hit single…or because they were switching from one label to another…James and his band never became hugely popular like some of their contemporaries. But the music has continued to thrive and survive, thanks to the internet making it accessible for everyone. At the centre of the album he has the blues; at the edges he mixes radio-friendly material with soul…This succeeds, for example, in the harmonica blues “Heaven Help Me” and the soft funk “Working On A Love Affair”. Three of the covers really stand out, with The Meters’ “Fire On The Bayou” perfect for this bass thrumming, holler and response setting, while a hi-hat popping rocked up version of The Yardbirds “For Your Love” really should have been a smash hit. It’s remarkably good fun and thoroughly irresistible, while still utterly throwaway. Whereas the thump, bump and brass of “Living For The Weekend” is an unabashed funk-a-junk strut. However it might just be the Barkan/Michaels composition, “New England Sunshine” that glitters in the brightest fashion here, the piano-strings ballad, again, as 70s as they come, with all the trappings of the huge swaying slowie from that era, but if you’re not crooning along by the end of it, then I’ll be very surprised. James Montgomery was described by the late actor/musician Jim Belushi as “simply one of the best” and also as someone who is “funkier than a six pack of onions!” In 1970 he formed The James Montgomery Blues Band and soon they were the hottest live properties on the Boston New England music scene along with J Geils Band and Aerosmith. Signed then to Capricorn Records in ’73, reviewers wrongly assumed the band were from the south when in fact they were from Detroit originally. James then signed to the Waterhouse label for his blues/rock album “Duck Fever” which was recorded in West 54th St, New York with some heavy hitting session musicians guesting and released in 1978. Now remastered and released on CD for the very first time. When Slater is dispensing heavy truths and Chris Cleave is delivering mournful guitar lines, the sense of alienation is so strong that it’s impossible not to wonder whether those stones, once gathered, could become material for the impenetrable obstacle of “There’s A Wall” – a gloomily glimmering finale of a rather moody record. The latest addition to Mutter’s impressive back catalogue mines a rich vein of polished melodicism, and devotees of his work in the past would be well advised to lend an ear to heartfelt creations such as ‘Love Is The Stranger’, ‘Weird Kid’ and ‘Field Of Stone’ itself. Field Of Stone is the Mutter Slater Band’s latest album…Billy Bragg said of Mutter Slater: “He has one of the greatest voices in British Rock and he writes a mean song too”…Also available on Angel Air Records featuring Mutter Slater is the previous album ‘The Champ’ and ‘Stackridge – The Final Bow, Bristol 2015′. This veteran performer is best remembered these days for his quirky exploits with prog rockers Stackridge almost half a century ago, but Mutter Slater has been blessed with one of the finest voices in British rock and he now has an opportunity to indulge his genuine passion for R&B, blues and soul via splendid albums such as this. The latest addition to Mutter’s impressive back catalogue mines a rich vein of polished melodicism, and devotees of his work in the past would be well advised to lend an ear to heartfelt creations such as “Love Is The Stranger,” “Weird Kid” and “Field Of Stone” itself. This album was originally released in 1981 just after the passing of legendary guitarist Michael Bloomfield. In addition to his solo recordings, Bloomfield is also known by many as a member of The Paul Butterfield Blues Band…hugely influential to so many other artists and bands in the 1960s. This album presents all ten tracks that appeared on Michael’s original album plus one bonus track (“Maudie”). There’s a short biography included in the package written by Austin Powell that quickly and effectively tells Bloomfield’s story in a nutshell. These tracks were recorded at various times and, as such, probably offer a good overview of the man and his music. With all the renewed interest in blues/rock in the twenty-first century, the timing just may be right for folks to revisit this man’s catalog. The contents of this engaging ragbag of Mike Bloomfield recordings were probably never intended for commercial release, but devotees of the late great guitarist’s work with seminal rock outfits such as The Electric Flag and Paul Butterfield Blues Band should find it well nigh indispensable. The contents span a broad time period from the early seventies to Bloomfield’s untimely death in 1981. …’Watkin’s Rag’ is a lovely, sprightly, ragtime-flavoured instrumental; another instrumental, ‘The Dizz Rag’, is charming and, although at times Bloomfield’s guitar playing isn’t particularly prominent, he plays searingly on ‘Big C Blues’. Early releases of the album included either ‘Sammy Knows How To Party’ or ‘Maudie’. This reissue has both tracks. Living In The Fast Lane was released just after Bloomfield’s death; the recordings were gathered from various sessions, but his talent shines through on every track, from up-tempo numbers like ‘Sammy Knows How To Party’, through the acoustic picking of ‘Watkin’s Rag’ to the mellow ‘Let Them Talk’. Eleven tracks which form a fitting testament to his musicianship and reissued not a day too soon. This album is being released by Angel Air in the UK and is a re-issue of an album with the same title released in 1981 with the addition of a bonus track ‘Maudie’, this album was originally released shortly after Michael’s death in 1981, it contains material recorded over several years but predominately around the min 1970′s, the bonus here is that the supporting musicians include Mark Naftalin who Michael played with in the original Butterfield Blues band…The pick of the material is the self written song ‘Big C Blues’ which is a slow Chicago blues that highlights some sumptuous restrained slide guitar playing by Michael and is one of the few tracks where he performs the lead vocal, in addition Mark Naftalin provides some wonderful duelling Piano. The bonus track ‘Maudie’ is an excellent song written and sung by Frank Biner who also sadly left us too early in his life, it has a much harder rock edge to it and some gritty lead guitar playing from Michael, of the non blues material the track ‘Roots’ is the most enjoyable with its infectious funky soul beat, very reminiscent of the Temptations in their prime…a very enjoyable and varied album that incorporates some talented musicians whose playing is impeccable. …In the summery ‘Andy’s Bad’, Mike’s slide guitar colours enhance the composition. On to the gospel tunes with ‘When I Get Home’, the funky ‘Big C Blues’ and the slide guitar from ‘The Dizz Rag’. As a bonus track the Angel Air Record label treats us to the jazzily constructed ‘Maudie’. Stephen SPAZ Schnee chats with British musician Jerry T. Jones (AKA Lushi) from GLAMWEAZEL about their new compilation album The Great Unknown plus his time as one of the driving forces behind ’80s band ONE THE JUGGLER. He talks about working with Mick Ronson, being influenced by David Bowie and the Kinks and so much more! Diana HUBBARD comments: “My music is for when people want to turn off the lights, listen and escape to another world. To dream of magical places in which the listener can participate and feel involved.” The style of Diana HUBBARD is romantic, seducing the listener with an elegant style, refined, while delicate. We enjoy the inclusion of a string trio on ‘Russian Roulette’ and ‘Medieval Heart’, with the contribution of Dennis KARMAZYN on cello, Carole SHIVE, violin and David CAMPBELL viola. Throughout the album, we can hear Jim COWGER on wind instruments, Al HENDRICKSON on bouzouki, Denny SEIWELL (ex WINGS) on drums, and Johnny PIERCE on bass…An elusive disc that seduces lovers of subtle emotions and refined music in the classic style. Another lost gem recovered from the vaults and reissued for the very first time on CD by the fine folks at Great Britain’s Angel Air label. The Angel Air folks never cease to amaze us with all the truly neat things they discover and reissue for an entire legion of new music fans to discover. Born in London, Diana Hubbard is the first child of L. Ron Hubbard…and LifeTimes is/was her one and only album release. Hearing this, many may wonder how on earth it is that this talented individual did not opt to pursue a career in music. Diana’s piano playing is emotionally gripping and real. Folks lending their support include Chick Corea, Stanley Clarke, Patrick Moraz, Denny Seiwell, John Goodsall, and Ric Panrell (!). Even though Billboard magazine gave LifeTimes a “top album pick” at the time of its release, for one reason or another the album did not hit the commercial target the way it should have. And the music eventually faded away into obscurity…until now. These tracks have held up exceptionally well over time, particularly when you consider the fact that the album was originally released in 1979. While hearing these tracks, you’d never in a million years know that these are recordings from the late 1970s. They have a big slick crisp sound that can easily compete with most modern recordings. Highly stylized melodic tracks include “Rose Colored Lights,” “Dream #23,” “Berlin 1945,” and “Midnight #3.” Smart, resilient, impeccable…and rather magical. Drawing on Rachmaninoff and other Romantic influences, the cinematic simplicity of elegiac ballads such as “Rose Colored Lights” is expressive and arresting, with Danny Seiwell’s sensual drumming measuring quiet pleasures as outlined by opulent strings and brushed with otherworldly synthesizer. Chick Corea may weave his cosmic magic on “Bewitched” and Patrick Moraz shimmer on “Morning” where emotional promise becomes palpable, although it’s a two-movement epic “Russian Roulette” that unfolds the whole progressive intent of Hubbard’s orchestrally enhanced, if somewhat quirky, enterprise. Musically she was discovered in 1976, and recorded this album in 1979. She herself said she wanted to make music that was felt, rather than heard, with romantic aspects of jazz. Diana wrote all the music herself, and received help from musicians such as Chick Corea, Stanley Clarke, John Goodsall, Michael Boddicker and Patrick Moraz. The music sounds like light classical with pop influences. Diana wrote an explanation for each song, and opener ‘Rose Colored Lights’ revolves around the yacht on the Mediterranean. The song was released on single the following year. The other tracks are in the same style. This album is now a rarity, and now appears on CD for the first time. A much sought after album, the only album ever recorded by the daughter of L. Ron Hubbard, in a slightly classical poppy way. Diana Hubbard was born in London, the first born child of L. Ron Hubbard, the founder of scientology. She was composing piano sonatas by the age of 6 and went on to attend the Royal Academy of Music in London. She released this, her only album, in 1979 and it is now available on CD for the first time…the impressive list of Jazz musicians involved includes Chick Corea, Stanley Clarke, Patrick Moraz, Denny Seiwell, John Goodsall and Rick Parnell.